This production opened on August 17, 2011 and closed on August 21, 2011. 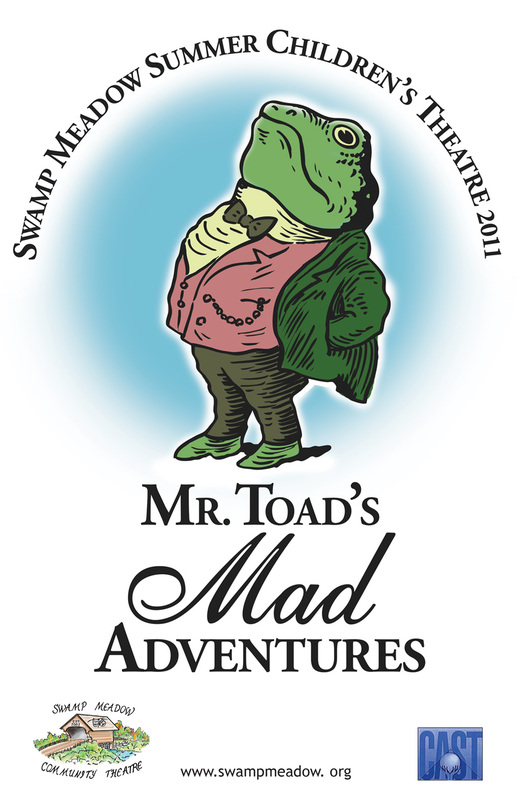 Mr. Toad’s Mad Adventures was adapted from the classic children’s book The Wind in the Willows by Kenneth Grahame and focused on Mr. Toad’s impetuous and perilous romance with the automobile. We had many talented young actors and actresses returning from past summers as well as quite a few newcomers, whom we welcome to the Swamp Meadow family! Toad of Toad Hall is an eccentric but likable squire given to “crazes.” His latest craze is an infatuation with motorcars… especially red ones! Unfortunately, he smashes them up as fast as he gets them. He even steals one for a wild ride over the countryside. Naturally, this gets him into a great deal of trouble. His dear friends Badger, Rat and Mole do their best to help, but their efforts aren’t enough and Toad ends up in prison after an uproarious courtroom scene. His imprisonment couldn’t please his long-time enemies, the weasels, more. They quickly take over Toad Hall and trash the place. Meanwhile, the jailer’s daughter, Polly, thinks Toad is an exceptional fellow and helps him escape… dressed as a washerwoman. On his way back home, he has a run-in with a barge owner who is horrified to discover the washerwoman is actually a toad! When Toad finally meets up with his friends again, they devise a clever scheme to recapture Toad Hall from the weasels in another wild scene.